Today's suggestion for the Capture Your Grief Project is a "Treasured Item". Unfortunately, I really do not have a treasured item from my past miscarriages since they all have happened in my first trimester. I have had NUMEROUS sonograms and ultrasounds but none of them have been positive so I do not have any pictures of them. The only thing I have that I would consider a Treasured Item are the pictures from my tubal pregnancy surgery this past December. You can clearly see where the little baby was hanging out in my tube, but they are really graphic and bloody and I'm sure most of you would NOT want to look at them! Instead of showing you my Treasured Item I am going to share with you pictures of one of the things that helps me deal with my grief. JUNK FOOD! I generally eat very healthy and even more so when I'm pregnant. It makes me so upset when I miscarry because I do eat so healthy and exercise but I still miscarry. Don't worry, when I am thinking clearly and rationally I know that it requires more then eating healthy to sustain a pregnancy! When I get the news I am miscarrying my healthy eating takes a back seat because I'm so angry and I don't care what I eat. On Monday this week, after finding out my hCG number had dropped, I stopped by Target on the way home. 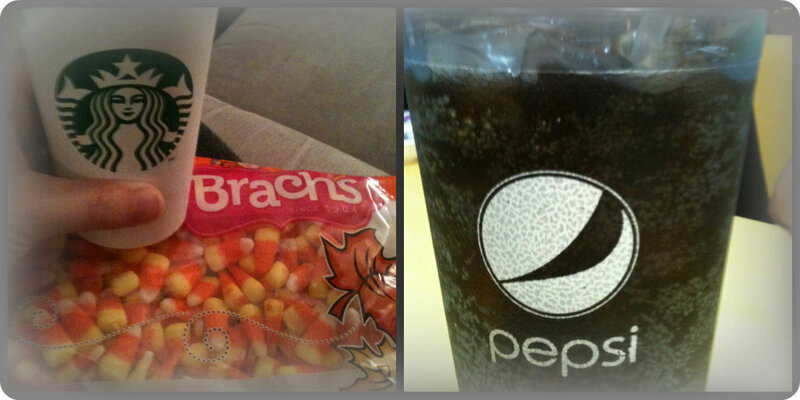 I bought a bag of candy corn and a Starbucks Venti Pumpkin Spice Latte. I also splurged this week and had a Pepsi with dinner. I actually do not know the last time I had a pop, it has probably been 8 months or more! It really did not taste good, so it was not even a good splurge. I hate to admit this, but we have also eaten out every night this week because the last thing I feel like doing is cooking something healthy! For more information on Capture Your Grief Project being hosted by Carly Marie, check out it out here. If you missed yesterday's post with Day 1-3 pictures, make sure to check it out! Thank you for all the messages you sent me last night and today. I truly appreciate all the thoughts & prayers. Today was the roughest day, emotionally, I have had so far with this miscarriage. So please continue to keep us in your prayers. Oh Andrea, I'm so sorry that this has been the worst day so far....so wish that I could be close by to hang out with you, walk, talk, cry, watch Netflix, each junk food with you! My heart is broken for you and my tears are many - I am praying for you and B and asking God to soften your anger, fill you with hope and comfort......I love you!